A broken computer keyboard gives the office loner a chance to undo his life's mistakes. TV series based on the British sitcom chronicling the week leading up to a couple's wedding. Two lovable rogues must break into the penthouse of an underworld gangster in order to steal a valuable artifact for their employer. 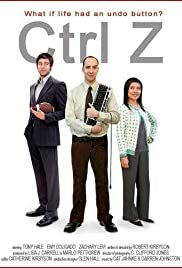 An office loner discovers he can manipulate the reality of his office from a magical computer. At first he uses his powers to get revenge on his boss and get the girl of his dreams. However things soon spiral out of his control. What if life had an undo button? This film was an award winner at the Sundance Film Festival and stars Tony Hale as a repressed, nerdy guy working at an office. He is encouraged by the very pretty Emy Coligado to just hit "CTRL Z" on his keyboard. All of a sudden, he realizes he can go back in time to change things. There is not much more to say about it, because the film is only six minutes long. Zachary Levi, who is the star of the TV show "Chuck" plays his boss. The film is easy to take and anyone who works in an office knows a guy like this (or, is this guy). Nothing earth shattering, just a slice of office life. Check it out.